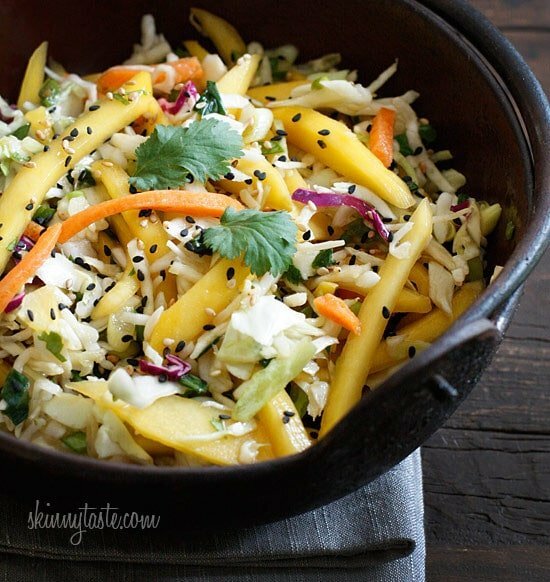 Light, fresh and crisp slaw made with shredded cabbage, carrots, lime juice, rice vinegar and a slightly under-ripe mango topped with sesame seeds. A perfect side to fish, pork and even burgers. Feels like summer here in New York, I bet a lot of you are firing up your grill, and what’s more popular than cole slaw with those burgers and grilled meats! When I make a slaw, I never make the creamy mayonnaise slaw like they sell in the deli with all the sugar in it, I actually despise the stuff! I prefer to keep it light and fresh. Slightly under-ripe mango’s are used in this recipe. In South America, a typical street food snack is under-ripe mango with lime juice and salt. The mango isn’t quite sweet yet and the texture is firm which is perfect for cutting the mango into strips for this recipe. You can use red cabbage or white or a combo of both. Sometimes I buy it pre-shredded to save time, it’s even great with broccoli slaw! This lasts a few days refrigerated. Gluten-free, low-carb, dairy-free, vegan and egg-free. Julienne the mango (cut into strips). 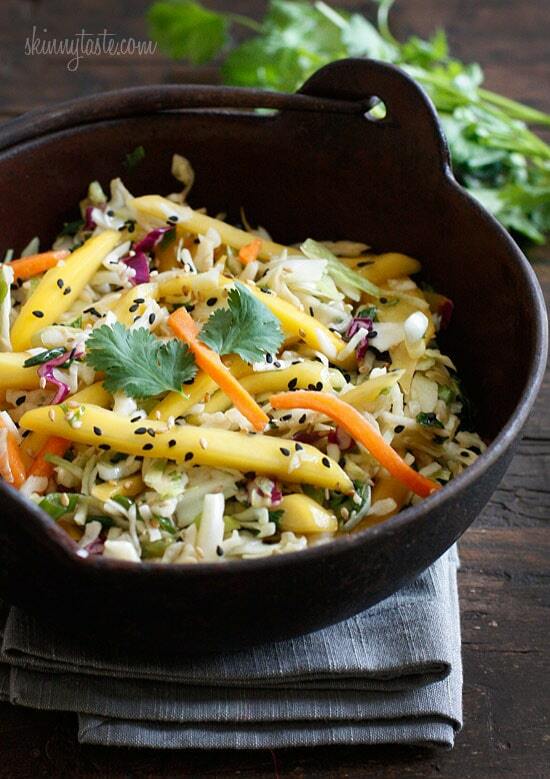 Combine with the cabbage, carrots, scallions and toss together in a large bowl. Let it sit at least 15-20 minutes to let the dressing soak in. Makes approximately 3 cups. Double it for more servings. This is so very good! I usually pair this recipe with your cauliflower fried rice and TJ’s cilantro chicken wontons—makes a wonderful, “escape-from-the-usual” and VERY low-point meal. Be sure to make in advance—-the flavors get even better the more it sits. Oh, I also add the zest the 1/2 lime for added tropical tastiness! This was fabulous! Crunchy, sweet, and tangy all in one! Easily could double this recipe. I am admiring you so much! It is incredible that you have so many healthy ideas, combining such simple ingredients into incredibly tasty (and good looking) meals. Does this taste as good if i dont use the mango? Looking for a asian slaw for a wrap! I made this last night to accompany Korean grilled chicken (from this site too) I liked it, but agree w.other reviewers that's the vinegar taste is a bit strong. I will def make this again, but next time will cut back one tbsp of the vinegar. I was expecting to not like it. I tried it because I love mangos. Anything with mangos should be good right? Well, its wonderful. Its such a unique and unexpected meld of flavors! Bravo Gina, you've done it again! I love this! I never know what to do with cabbage that's fun and delicious. 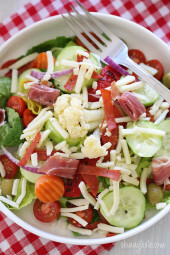 The bright colors make it pop and add some excitement to my salad diet. My husband likes it and he runs at the word "coleslaw" and has detested mangos. Score! It's also wonderful topped with browned and toasted peanuts on the stove or oven to make a filling and quick lunch. My mango was very ripe so I puréed it and added to the dressing. I had pineapple so grilled & diced & it-yum!!!! It will accompany fresh caught Hailbut tacos. Cabbage is not boring anymore! Great way to eat this vegetable which has a lot of vitamin C, K, A and folate. FYI – Most people think Bragg's is low sodium. It is not. Read the nutritional info label … Braggs label shows a serving size of 1TEASPOON equaling 320 mg sodium, USDA rates no-name everyday low sodium soy sauce at 1 TABLESPOON (3 times as much product!) equaling 533 mg sodium. I have nothing against Braggs (oh, maybe cost!) but don't use it because you think it is low sodium. 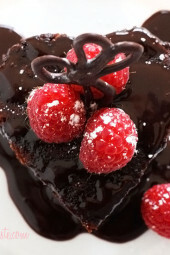 Like all your other 10 billion followers, I L O V E your recipes! Just a note of interest, Bragg liquid amino acids are the perfect substitute for soy sauce; excellent taste, low sodium, and good for you. This was so good! I have made twice. Once with coleslaw mix and once with shredded red cabbage. Both times it worked great. I did cut the sesame oil in half and used veg oil for the other half. I am just not a huge fan of sesame seed oil. Made this today, very yummy! I left out the scallions (DH can't eat them) and added a bit of chopped cilantro (I had some extra.) I also added a tiny bit of agave nectar; I think my mango could have been sweeter. But we liked it a lot, will definitely make again! Just made this tonight and I LOVED it! I added to a salmon buger. just made this tonight and it was a big success! i did 2 things different..doubled the amount and 1 whole lime was too much..so i added one packet of splenda to cut some of the acid! the kids, hubby and i loved it! oh, also added some fresh cilantro to the dressing! thanks gina! Besides my failed attempt at properly julienning (sp?) the mango, this was fantastic and pretty easy to make too. Made it today and it was delicious!! I added about 1/2 tbs extra of tamari as it was a bit too vinegary (I didn't have rice vinegar, all I had was red wine vinegar). I also added some cayenne pepper and chopped cilantro, yum yum! Thanks for this delicious recipe!! Think there is anyway to adapt this slightly to make it a little less asian…a little more mexican? 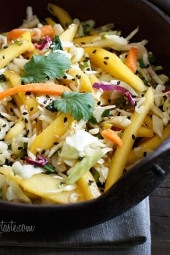 Doing a party this weekend with mexican food and thought a mango slaw would be great with it! What could I use instead of the soy or sesame oil? Vegetable oil? Red wine vinegar maybe? I made this today exactly as recipe states. Add cooked chicken breast and slivered almonds and you would have a complete meal. A little to much vinegar taste to me so I will tweek it next time. And I seemed to have a lot of the dressing in the bottom of the bowl. I did like it and will make again. New to site but I am seeing lots of recipes to try. Love that the WW points are listed. Just made but I added cilantro and 1.5T of agave nectar it was so yummy!! Can't eat mango. What could I use instead? green apple, pinapple, pomegranate would probably be great, strawberries….typically any slightly sour fruit. Fixed this slaw tonight. Felt it needed a bit more sweetness to it. The mango was good, but not enough for my tastes. Has anyone added anything to counter-balance the tartness of the dressing? My husband and I loved this. I added 1 tsp. of chili garlic sauce to spice it up a bit. I am hosting our Women's Wine Wednesday tonight and I made this as part of our dinner. Looking forward to serving this to my friends. I'm sure it will be a hit! Sounds wonderful and was easy to make. I made this yesterday & it was so delish! I will surely make this a lot over the summer…love it! I love your recipes! I have a question about the WW Points+ for this recipe – when I plug in the ingredients into the recipe builder, the only one that registers any points plus is the sesame oil (3 P+ for the entire recipe), but you listed each serving as 2 P+. Am I doing something wrong? I want to make sure that I am using the recipe builder properly, so I don't undervalue my recipes. Thank you so much! A-MAY-ZING. Am now addicted to this recipe and have taken a few friends along on my journey. If I have to be addicted to something let it be good foodlike this. I made this with grilled chicken and the brown coconut rice for dinner and it has become a repeat meal. Do you use seasoned rice vinegar or plain? I think it would be great if it sat overnight! I was wondering how far ahead you would say you could make this? Or would it be best to make everything but not put the dressing on until ready to serve or would it be even better if it sat for hours instead of just 15-20 minutes? Thanks for the advice! can i use red cabbage instead of white cabbage? i could only find the shredded red in the store. So good with your Kuala Pork! Just awesome! excellent! Paired it with grilled burgers. Awesome recipe! I'm glad to have found a slaw recipe that doesn't require mayo! Yummm this looks so refreshing–perfect for spring! Had a huge cookout this weekend for 28 adults and kids. Made this with pulled pork, ribs, and chicken and it was wonderful! My hubby doesn't like mayo-based slow and I'm no carbing so this was perfect for both of us. I doubled all of the veggies and let it sit overnight. Made one more batch of the dressing the next morning and tossed it again. Delish! Looks yummy! This Asian salad best if serve in Small Bamboo Boat to express the exotically Asian style. I'll try this at home. That looks beautiful! I love the addition of mango- I would have thrown that into my stir fry tonight if I had seen this sooner! Thanks for the inspiration. Thanks again for another great recipe! With a few modifications (because of ingredients I already had at home) I made this for my family for dinner last night. I did not have mango at all. For the carrots I substituted cucumber, the sesame oil was subbed with canola oil and I only had white sesame seeds. The dressing turned out great. My cabbage slaw mixture was very tasty, but it had a very monotone color – everything was green-ish/white… cabbage, cucumbers, green onions & cilantro. HA! It was delicious, though! THANKS. Hi Gina! Looks great! What do you think of spicing it up a bit with adding some ginger? or maybe some chili oil? Can't wait to make this for my next cook out. I wanted to make this so bad but didn't have any coleslaw and didn't feel like going to the store. I had a small head of iceberg lettuce and used it instead. It was WONDERFUL!!! Even my husband loved it and I was a little concerned as he's a big meat eater. I BBQed him some chicken and was thinking chopped chicken mixed in would be great too for next time. But I'm definitely using cabbage next time! The recipe looks great but I'm allergic to mango (I get rashes that make me look like a burn victim – no so good), so I'm wondering if I could substitute with papaya? It's been a while since I've eaten mango so I'm not sure about the texture or the sweetness, will the papaya be too much or not enough? Had this tonight with a rotisseried chicken breast. Such an easy & yummy side dish! 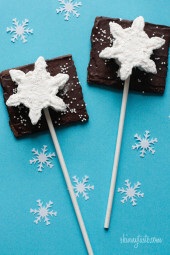 Gina, I pinned this recipe today and it had 37 repins in less than an hour! I love your blog and recipes and am so glad people are catching on to how great this resource is. I would just add a salted nut of some kind and wrap it in a pita as a light meal. Yum! I see that I am not the first person to comment, but let me say that I love SKINNYTASTE.COM. It is definitely my favorite recipe blog/website. And it's so strange that you added this when you did. Just yesterday I was making my sister's Broccoli Slaw recipe because like in New York, Pittsburgh is experiencing quite the heat wave. I walked over to my computer and started noting the ingredients (in my fitness pal – another great website). To my dawning horror, I now realize why I gained 10 pounds last summer – Broccoli Slaw Salad (with those ramen noodles) happens to be a favorite of mine, but it is LOADED with fat… EEEKKK!! But wait! NOW, I have an ALTERNATIVE!! YEAH!! HURRAY!! Just made this! cant wait to try once the dressing has set for a little. I did cheat a little and try it before and it was already good! I think using apple cider vinegar would be wonderful. Im not a fan of rice vinegar even though I do use it a lot in Asian dishes, its a flavor that really stands out. I think next time I would use 1 less tablespoon. so excited to have this for dinner tonight! Thanks for all your wonderful dishes. Continue to love your recipes! Do you think this would work with apple cider vinegar instead of rice vinegar? Let me know what you think! Looks wonderful! I love that you said to use a slightly under ripe mango. Nothing worse than a mush one!! Love the recipe! I am a size 16…and love food. It shows! Like every busy Mom, I want to eat better and lose weight. Your website is amazing, it's so helpful. Serious! Just amazing. Thank you so much for making all these recipes available. Just genius…btw we have the same camera, isn't it a great camera? Thank you! Isn't it a great camera for the price! Looks good, but my daughter is allergic to mangoes. Do you think I could sub in pineapple? Might have to give this a try tonight! I would use papaya instead. Yum! This looks like it would be great on fish/shrimp tacos. I'm going to try it this week – thanks! 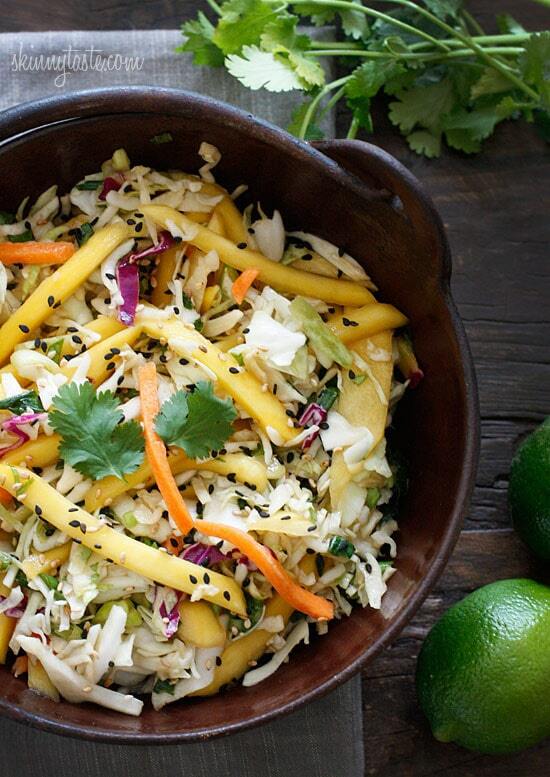 Love your use of mangoes in this slaw, Gina! It looks so delicious and flavorful. Oh my gosh this looks so light and delicious! The perfect dish to make during this heat wave on the East coast! This looks amazing – I can't wait for fresh mango! Gina, which recipe of yours would you recommend to service this with? Looks delish! Oh Gina, this looks SOOOO amazing!!!! I'll be making this VERY soon!!! BTW, I made your hot spinach dip for a potluck on Saturday (and linked the recipe and your site on my blog) It was SENSATIONAL!!! I know I'll be making that many times over. All the best, and as always, THANK YOU so much for your wonderful site!!! I'm making crock pot pulled pork this week and I cannot wait to try this with it. I made the crock pot pulled pork on Sunday. Turned out good, but I used mesquite smoke and want to try hickory some next time. Bet it goes great with this slaw. What a fabulous, unique, slaw! Yum! Katrina and Gina… I enjoy your blogs very much. We are into Paleo, Gina, so this slaw is going to be heavenly. We use rice vinegar a lot. Mango goes with everything, me thinks. Would it be alright to put your bogs on mine? http://www.gardenofenid.com. It is still a work in progress so … bear with me.